A record given to a charity shop is to be sold for over £3,000 after it was found it belonged to Jimi Hendrix. The album, which was produced by Paul McCartney, was given to the Oxfam Bookshop in Henley, Oxfordshire, by an unknown donor 18 months ago. A volunteer noticed a handwritten dedication on the sleeve and following extensive research it was discovered it had belonged to the legendary musician. It will be auctioned at a sale of pop memorabilia at Christie's on 5 May. Jill Partrick, who runs the store's music department, says she knew the record was valuable as soon as she saw it. "The dedication on the back was so unusual it had to be real," she said. 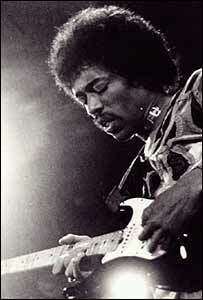 The dedication thanked Jimi Hendrix for playing on the album and was signed McGough & McGear. McGough & McGear were Roger McGough and Michael McCartney, Paul McCartney's younger brother. They were part of a 1960s group called Scaffold. Mrs Partrick and her husband David spent more than 18 months trying to track down the musicians to verify that the record had been given to Hendrix. "Michael McCartney wrote to us saying that he hopes the sale makes a million for the charity," said Mrs Partrick. "Christie's have estimated the record at 2,500 - 3,000 but I think they're being conservative. "Hopefully we'll make more than that, but even if it doesn't I'm pretty sure this is the most any Oxfam record will have been sold for."